The only elementary school in Shoreham in 1960 was Briarcliff. There was one class on every grade level. The kindergarten was in the little school on North Country Road near Woodside that is presently an office. In 1962 Miller Avenue was under construction on a street that was only one block long. There was no direct access to 25A. The school was constructed in three stages; the first ended at the north end of the office hallway. The west wing was constructed in 1966, and the east wing in 1970. What is presently the library was a cluster of four classrooms, reflecting the educational philosophies and open school design of the 1960's. In 1973, with the movement of school consolidation, the district merged with Wading River. Having once sent all students in grades 7-12 to Port Jefferson, the district began retaining the middle school grades, housing them at Miller Avenue during the construction of a new 6-8 Middle School. Upon completion of the school, Miller Avenue then became a 1-5 school, dividing students in grades 1-3 geographically with Briarcliff, and Briarcliff receiving all kindergarten students. Since 1973 the school enrollment of Miller Avenue has doubled; class sizes that were once in the teens rose to the low twenties. 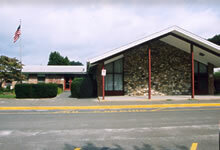 The Library and the Resource Room were moved in 1975 to their present locations. Music portables were added when classroom space was needed in the building, and since then, there have been two additional portable classrooms added as well. Miller Avenue has been at the vanguard of innovative educational programs for decades. Some of our past courses included inter-age classrooms, Suzuki instrumental lessons, trips to Frost Valley, foreign language instruction during the regular day, and a dance program. These have evolved given the needs of our students and community to their current incarnations including: becoming a Teachers College, Columbia University Reading and Writing Project School; continuing the philosophy of the National Circus Project (our school was one of the original partners in this pioneering program over 30 years ago and we now call it SWRCUS); hosting a student Bell Choir; Fifth Grade Musical; Authors and Artists in the schools; student performances at our Town Hall Meetings; joining in on our Math Night and Evening of the Arts; harvesting fruits and vegetables from our garden; and overnight learning trips to Ashokan and Philadelphia. The school has a long tradition of reaching out to the multiple talents and interests of our school population and staff. It remains a vibrant and happening place, and looks forward to helping children live successful, fulfilling lives for years to come. Note: Special thanks to Nancy Westover, Miller Avenue's first school librarian, for helping compile our shared history.